I’m sure that when you think of choirs, what often comes to mind is chapel choirs, school choirs, music groups, and professionalism. 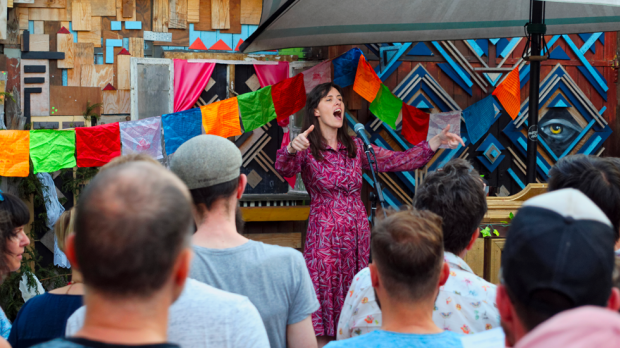 What you don’t think of is a group of 50 or so strangers meeting at a pub and learning to sing a slightly outdated, yet definitely popular, song — then performing that song — in just over an hour. That is, essentially, the beauty of FRINGE WORLD’s Instachoir. Being held for three consecutive Mondays at The Moon, anyone who wants to come can book, and it’s all over and done with by 7:50pm. When I arrived and was handed the lyric sheet for The Spice Girls’ Stop. I couldn’t help but wonder what exactly I was in for. First, like in any good choir, there are the warm ups; a quick scan of the room to see if anyone had a birthday within the last week, which someone had, allowed us to sing happy birthday to the sound of “sh”, shortly afterwards a lip trill (just as funny as it sounds) and a short time to learn the actions of the song. As everyone in the room slowly warmed up to the idea of actually singing the song, the group was divided into melody, high, and low parts accordingly to make for a three-part harmony, with the lyrics sung by the high or low parts beside the melody. The teacher and conductor for the evening, Claire Louise Coleman, confided in us that she had never actually done Stop for an Instachoir piece before, but assured us all that we were singing wonderfully. With her guidance each part was learnt and among this group of complete strangers emerged something quite like a song. As it was found, some of those in attendance had previously been in choirs, while some had never even sung before. Though, as one woman said and which I can confirm, singing a three-part harmony whilst also performing actions can seem like patting your head and rubbing your stomach; good if you know how to do it, but difficult when you’re trying to focus on one or the other. Once the hour was up, our group walked towards the urban orchard and took up the stage where the silent disco is usually held. Claire gave us a small introduction for those situated as our audience, gave us our starting notes, and started us in as the guitarist began to play. Although it was over in only three minutes, the experience was certainly worthwhile. While awkward at first, being able to learn, sing, and perform a song with a group of strangers in turn created a sense of community and teamwork with people who wouldn’t interact on a daily basis. Even if you think you’re terrible at singing, even if you’re horribly awkward around people, just for one night, join in with a group of strangers for what will turn out to be one of the most memorable performances you can give. Check out the latest effort from the super rad Instachoir! One last chance to come along, next Monday 11th February for 80s hit of wonder “Kokomo”.